Take Exit #28 for Peachtree Dunwoody Road. 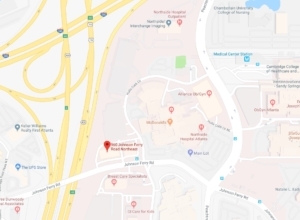 At the end of the exit ramp, turn RIGHT onto Peachtree Dunwoody Road and drive 0.3 miles. Turn LEFT onto Hammond Drive (at the Publix shopping center) and drive 0.5 miles. (You will cross over GA 400, and pass Barfield). Immediately after the Sheraton Hotel, Perimeter Ridge Office Park (Brown brick buildings) is on the right. 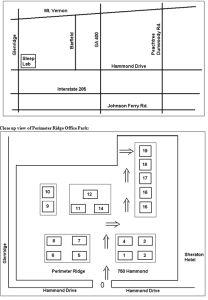 Enter Office Park and follow diagram for Building 19, Suite 100. Parking is available directly in front of the entrance to the Sleep Lab. Take Exit # 26 for Glenridge Drive / Glenridge Connector. At the end of the exit ramp, turn RIGHT onto Glenridge. Go 0.3 miles to the end of the road. Turn LEFT onto Peachtree Dunwoody Road and drive 0.5 miles. miles. (You will cross over GA 400, and pass Barfield). 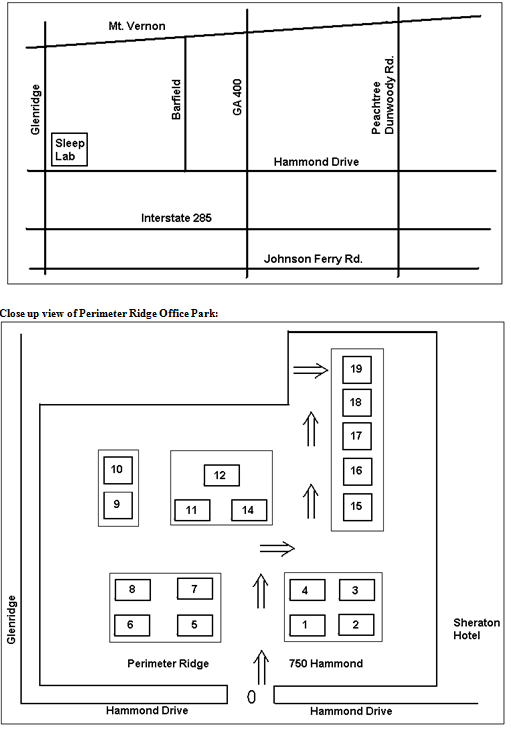 Enter Office Park and follow diagram below for Building 19, Suite 100. Parking is available directly in front of the entrance to the Sleep Lab. Traveling NORTH on NORTH on Interstate 75/85 through downtown Atlanta. Drive NORTH on Interstate 75/85 through downtown Atlanta. Follow 85 NORTH (exit veers to the left), Follow Georgia 400 ( exit veers to the right). From Georgia 400, take Exit 4A for Glenridge Connector and Peachtree Dunwoody Road. At the end of the exit ramp, turn right onto Glenridge and drive 0.3 miles to the end of the road. Turn LEFT onto Hammond Drive (at the Publix shopping center) and drive 0.5miles. (You will cross over GA 400, and pass Barfield). DTake Exit 5, toward Sandy Springs. Merge onto Abernathy Rd and drive 0.1 miles. Turn LEFT onto Barfield Rd and drive 1.0 miles. 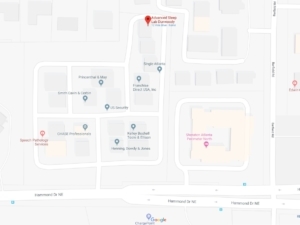 Turn RIGHT onto Hammond Dr and drive 0.1 miles. Immediatedly after the Sheraton Hotel, Perimeter Ridge Office Park (Brown brick buildings) is on the RIGHT. Drive SOUTH on Interstate 85. EXIT onto Georgia 285, going WEST. Then follow directions Traveling West on GEORGIA 285 above.